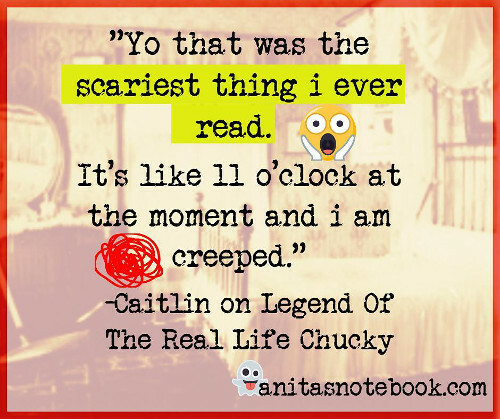 The picture above is a comment made by reader Caitlin after she read the story ‘Legend Of The Real Life Chucky’. No doubt about it, there’s something thrilling about reading scary stories late at night. 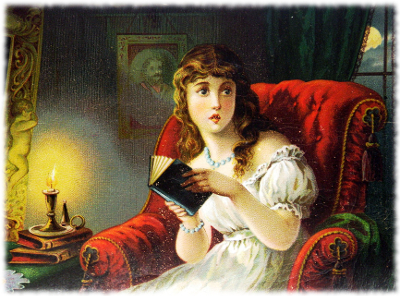 If you’re reading *the right* scary stories then you are spooked out of your mind, to where any little noise or shadow raises the hair on the back of your neck. You are thrown into full paranoia mode, feeling like something might be in the darkness right outside your window (Slender Man). Or maybe you even get the feeling that there is suddenly a Presence lurking somewhere in the house (Arabella). Does this sound like a terrible experience? Then reading scary stories late at night isn’t for you. It might be better to wait until the safety of daylight to venture into the world of scary stories. And that’s okay. But for us scary story junkies the spooked out feeling is the best part of the experience. Like when you get to the top of a roller coaster and then it suddenly drops, the terror is part of the fun. Does that make us crazy? Maybe. Crazy awesome. So here’s to you Caitlin and everybody else out there who likes to read scary stories late at night, I’m right there with you! *high five* Only people like us who love scary stories will understand why it’s so much fun to be spooked out haha.